At Tahoe Resources’ Annual General Meeting shareholders should question company leadership about the risky and dangerous practices that have led it into lawsuits and violent conflict in Guatemala. as a threat to national security? Question # 2: If Tahoe Resources intended to build relationships based on trust with local communities, why did it start out working with a US security and defense contractor with military history and experience in “dangerous and difficult environments”, including Iraq and Afghanistan, to develop its security strategy? Question # 3: Why does Tahoe Resources blame “outside influences” or focus on “inaccurate press reports” each time one of its in-country managers is detained in connection with abuses, instead of reporting on the immediate steps it will take to address the issues at stake? Question # 4: Why did Tahoe Resources race to put the Escobal mine into operation, despite numerous community consultations in which tens of thousands said no to mining when it knows that this is a pattern in Guatemala that leads to conflict and violence? 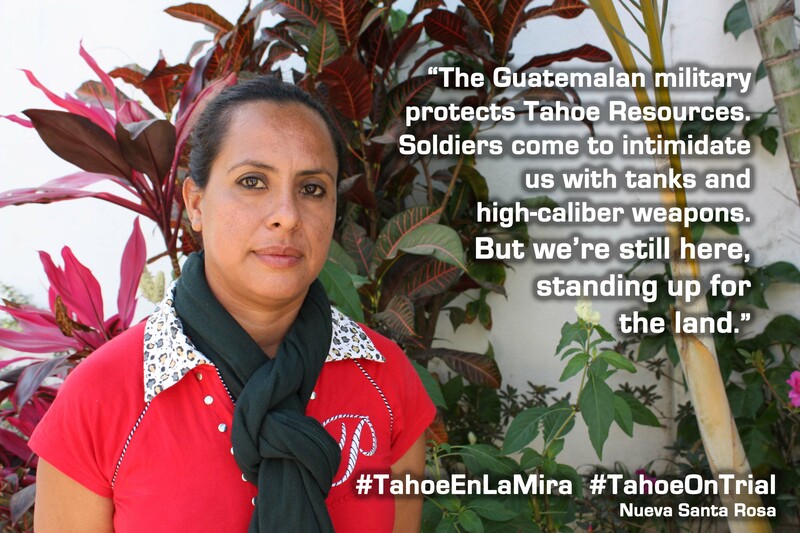 Two company managers and the company itself face three lawsuits in Guatemala and Canada based on allegations and evidence linking Tahoe Resources and its employees with environmental harms and violence. Furthermore, a pending decision from the Constitutional Court will determine whether or not the Guatemalan Ministry of Mines followed due process when it refused to consider more than 200 individual complaints against Tahoe’s exploitation licence. Chair of the Board, Kevin McArthur, has also been summoned twice to give testimony about the company’s practice to suppress dissent around the mine, given that over 90 individuals have faced spurious legal processes since 2011. The company’s efforts to suppress opposition at the Escobal mine, with the support from the Guatemalan government, are generating fear in surrounding communities, not support. As the Norwegian Ethical Council found in its 2014 annual report, in which it recommended against investing in the company, the likely outcome of this approach is even more serious human rights violations. Is this a company you want to be involved with? Answer # 1: Tahoe Resources claims to enjoy community support for the Escobal mine, but fails to mention the years-long assault on local opposition, which culminated with the declaration of a State of Siege in May 2013, during which 6 anti-mining leaders were arrested and more than a dozen more were issued arrest warrants. All were later let go and absolved of all charges. Earlier, in June 2012, the company was concerned about opposition to its project when it sued the Guatemalan government for failing to do enough to protect the Escobal project. Not long after this case was ended, the government, with support from Tahoe, established the Inter-Institutional Group on Mining Affairs in San Rafael las Flores, that local community members consider a military intelligence project and part of efforts to intimidate those opposing the Escobal mine and its future expansion. Answer # 2: A militarized security strategy was put in place to suppress local opposition from the start. According to Tahoe Vice President of Operations, Donald Paul Gray, since 2011, Tahoe has worked with the International Security and Defense Management, LLC, a US company led by former military personnel with experience in Afghanistan and Iraq. Through ISDM, Tahoe contracted Grupo Golan and Alberto Rotondo. Rotondo formerly served with the Peruvian navy and, according to his LinkedIn page, has received US military training in psychological warfare and counter-terrorism in low intensity conflicts. He is now under arrest, awaiting trial for his role in allegedly ordering private security guards to shoot on peaceful protesters on April 27, 2013 and then trying to cover up the crime. Answer # 3: On May 1, 2013, just days after private security fired on local activists outside the Escobal mine, Tahoe Resources issued a statement trying to pin the blame elsewhere: “violence from outside influences,” was responsible for escalating tensions around the mine site. On May 6, 2013 wiretap evidence demonstrating that then security manager, Alberto Rotondo, ordered private security to attack protestors was released at a public hearing in Guatemala. Just days later Tahoe’s Investor Relations official, Ira Gostin, denied that the wiretap evidence had been made public and stated that claims that Rotondo ordered protestors shot were made-up. On Monday April 13, 2015 a Guatemalan judge denied bail to Carlos Roberto Morales Monzón, Administrative Manager and Legal Representative of Tahoe Resources’ subsidiary, Minera San Rafael S.A., and ordered him to pre-trial detention on charges of industrial contamination. Instead of focusing on the gravity of the charges and addressing the evidence, Tahoe Resources issued a press release focusing on “inaccurate press reports” for referring to Monzón as a “mine manager” rather than an “employee”. Even Tahoe’s deflections reveal blatant inconsistencies given that a February 2013 Constitutional Court decision refers to Mr. Morales Monzón as the Administrative Manager and Legal Representative for Minera San Rafael, Tahoe Resources’ Guatemalan subsidiary. Answer # 4: Since 2011, there have been five municipal referenda and eight good faith votes in communities impacted by Tahoe’s projects in the municipality of San Rafael las Flores. All have voted overwhelmingly against Tahoe Resources’ Escobal mine and the expansion of other projects in their territory. One such good-faith vote rejecting Tahoe took place in San Juan Bosco, a farming community just seven kilometers from the Escobal mine and directly impacted by another Tahoe held exploration license, Juan Bosco. Organized opposition to Tahoe is ongoing. Two more municipal referenda are currently being planned in the region – the next is scheduled for May 17 in San Juan Tecuaco in Southern Santa Rosa. Community leaders and local activists demanding consultation and respect for their right to selfdetermination, people with no previous issues with the law, have been targets of more than 90 spurious criminal charges. These same people have suffered threats and violent repression since the arrival of Tahoe Resources to their communities, and three have lost their lives.